Of the multitude of spider species in the United States, only two spiders have the potential to inject a lethal dose of venom to a human: the northern recluse and black widow spiders. In most cases, their venomous bite is incapable of administering enough poison to kill an adult; however, immune suppressed individuals and children are still susceptible. There are three varieties of black widow spiders: the northern black widow, the southern black widow, and the black widow with the usual red hourglass marking on its lower abdomen. To deter recluse spiders and black widows from your home, use trapping, exclusion, vacuuming, and other such methods to clear out possible hiding places. If needed, use insecticides. Identify the spider. Is it a black widow, a recluse, or is it harmless? You can use more specialized methods to deal with the spider if you know which one it is. All black widows are glossy black, but the northern black widow may have white stripes and red dots instead of the red hourglass marking you might expect. The female black widow has an upper body that can be up to half an inch long; males are even smaller. The recluse spider on the other hand can have a 3/8 inch long body, as well as a dark violin-shaped marking on its backside. It also has only six eyes instead of the usual eight. Northern recluse spiders do not have banded legs unlike most other spiders. Clear out hiding spaces. Brown recluse spiders like to hide in dark areas during the day. Therefore, reduce as much clutter from your house as you can, since these are ideal hiding spaces for it. Place your stored items into enclosed plastic bags or tight-fitting containers to keep out any creepy-crawlies from taking shelter in it. If needed, use tape to seal the edges of boxes to be safe. Vacuum up existing webs. If you leave spider webs around the house, the spider may come back and possibly lay eggs. Vacuum up all webs to avoid this. If the spider is on the web or there are eggs, dispose of the vacuum bag or else spiders might come crawling back out. Black widows are more easily discovered than the brown recluse due to its unusual web. The most effective time to search for the black widow spider is during the night; it will generally be found hanging upside down on its web. The black widow spider will store her eggs, which are the size of small peas, on her web. Seal crevices and cracks around your home with weather stripping, caulk, or expanding foam. This step is important because it will deprive brown recluse spiders of places to hide, and prevent black widow spiders from entering. Install tight-fitting screens on all your windows to deny them entry from outside. Apply stick trips or glue boards to snare any wandering spider. These traps are extremely effective against the brown recluse. Place the traps on the floor, in close proximity to storage areas, closets, or anywhere you have seen spiders. These traps are effective not only against spiders, but any insect in general. Apply insecticides to crevices and cracks where you believe spiders are dwelling. Only use recommended pesticides in infested locations like attics or crawl spaces. Use the pesticide around the perimeter of your house, if you observe many spiders outside. Check out my article on how to keep hobo spiders out from your home. 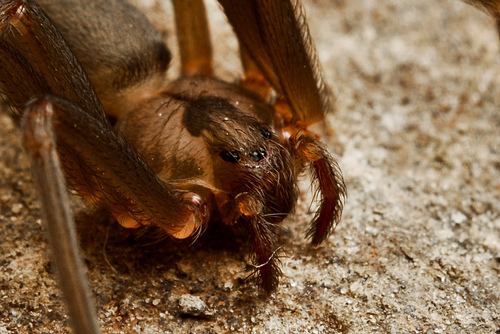 Click here to learn how to repel spiders naturally.